Okay, so you all know that I’m on a solids kick. I’m seriously tempted to start buying fabrics to make a quilt completely out of solids, especially since Joann’s has a decent selection of Kona cottons that just make my heart sing. Yeah, that doesn’t look very vintage does it? Ann Champion is the lucky owner of this top. It’s thanks to her kind permission that I’m able to share this beauty with you. Check out her post for the details on this stunner. Anyway, why does this particular top make me think ‘modern’? Jacob’s Ladder is normally seen set within sashing. In this example, the blocks are all set side by side, creating an interesting secondary pattern. Next, the use of color in this top is extraordinary! The ‘background’ is not comprised of white (or cream). Instead, the maker elected to use a lavender instead. And really, how many of us would think to use lavender with two shades of orange? Not many of us, I’d guess. I’d have thought about using a deep purple as a foil to those luscious oranges, but never something as light as that lavender. Also, I love that the white catches the eye without overwhelming the rest of it. The white and lavender provide a nice counterbalance to the two oranges. 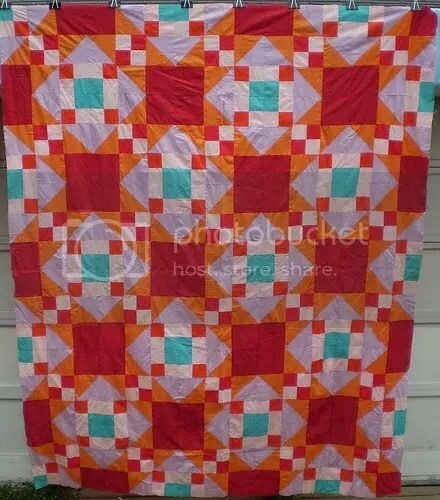 The turquoise gives the quilt a zing, bringing some cool to what would otherwise be a very warm quilt. I love when traditional quilt blocks are given such a crisp ‘make-over’. The lines in this top are strong, uninterrupted by busy prints that confuse the eye. I think that does it for now.. Let’s see what I come up with for next Think Modern Thursday!